This is teaching materials for a short story that would be considered untraditional. 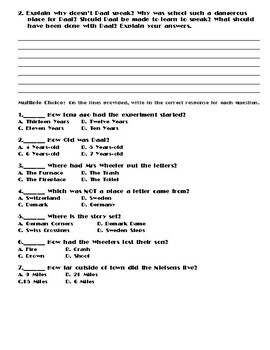 The assessments included vocabulary acquisition, critical thinking questions, and recall or comprehension questions on one sheet. These questions come in the forms of a mixture of matching, short answer, and multiple-choice. By completing this sheet the student will demonstrate an understanding of the material on multiple levels. The other assessment is a creative art sheet. The creative art sheet asks the student to use the details from the story and their own knowledge, experiences, and imagination to synthesize a totally new work, this is a picture that is a visual representation that recreates of a scene, character or maybe the student's use or view of an aspect of the story. Along with this picture the student will explain their work with a short explanation. NOTE: I have decided to include the Word Documents that the PDFs are created from so that if you would like to customize the unit for your classroom you can. However, I have used formatting and custom fonts that are not standard with many versions of Microsoft office. This may mean that opening them with a different version of office or without the same fonts installed will throw the formatting off. If so it may take some work to adapt them in your class. I am including them as an extra and would ask that I am not rated on the usability of the Word Docs. Since they are not the finished product, but an extra.